Since the mid-1980s, the feminist art-slash-activist group Guerrilla Girls have critiqued sexism and racism in the art world. Seeking anonymity behind gorilla masks, the group of female artists have famously questioned if women need to be naked to get into the Metropolitan Museum of Art, criticized the exclusion of women of color in MoMA exhibits, and advertised statistics on violence against women in striking, graphic posters, among many other protests. 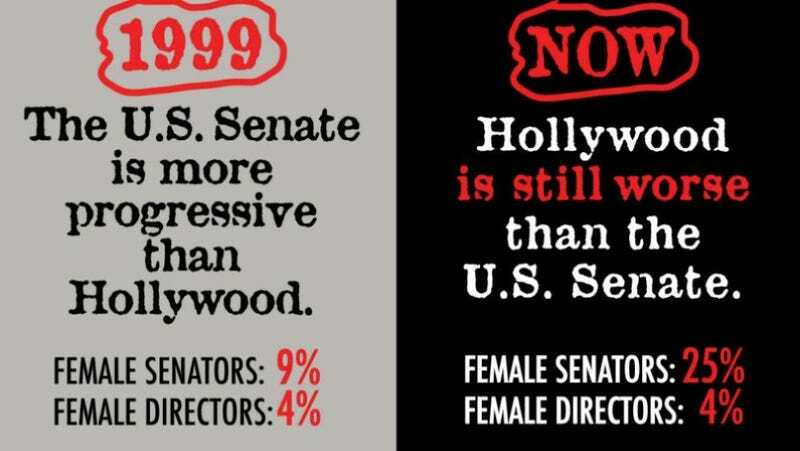 One of their campaigns is their 2003 billboard that claimed that “the U.S. Senate is more progressive than Hollywood,” comparing the 14 percent of U.S. senators to the four percent of top 100 films directed by women. And because not much has changed (surprise!) in the decades since the Guerrilla Girls began targeting Hollywood’s discriminatory practices, the group is now reviving the campaign Variety reports. Their new poster reveals that while women’s representation has gone up in the Senate since 1999 (25 percent today vs. the nine percent in 1999) Hollywood is still falling behind, with women only directing four percent of the top 100 movies last year. The new campaign is also co-sponsored by the Center for the Study of Women in Television and Film, which releases a “Celluloid Ceiling” report every year to track women’s employment in studio movies. It’s tempting to see the Guerrilla Girls’ efforts as relevant to a more distant decade like the 1980s, but given that the institutions they protest in Hollywood, the art world, and Washington continue to remain stuck in the past, the Guerrilla Girls are still, unfortunately, vital as ever. Guerrilla Girls Go Getty: Sell-Out? Or Smart Move?